Installing a sump pump and waterproofing system is the least disruptive and most effective way to keep a basement dry -- and keep it dry all the time! The following are steps our basement waterproofing technicians take when installing a sump pump system in your home. At Best Home & Property Services, our certified basement waterproofers can install a complete sump pump system in just one visit to your home! For a FREE sump pump installation estimate in North Carolina & South Carolina, including Camden, Florence, Gaddysville, Loris, Marion, Myrtle Beach, Rembert, St. Matthews, Sumter, Tradesville, Trio and other nearby areas, call or e-mail us today! First, the floor around the edge of the basement is jackhammered, and a layer of clean stone is set down. A perimeter drain is installed on top of the stone, and is backfilled with more clean stone. To allow for future testing or inspection, Best Home & Property Services will install several "ports" in the perimeter drain, where a hose or dehumidifier drainage line can be inserted. During annual checkups and sump pump maintenance, this helps us with testing and inspection. If you don't already have one installed, be sure to ask about our battery backup sump pumps, as well as our basement wall coverings,. We also recommend our ENERGY STAR® rated dehumidifier, waterproof basement flooring, and other basement products that can add energy efficiency, beauty, and comfort to your home. Best Home & Property Services also provides crawl space sealing and encapsulation! When you decide it's time to waterproof the basement and install a sump pump in your home, we are ready to help! We offer free, no-obligation inspections and written sump pump installation quotes to all homeowners in our North Carolina & South Carolina service area. 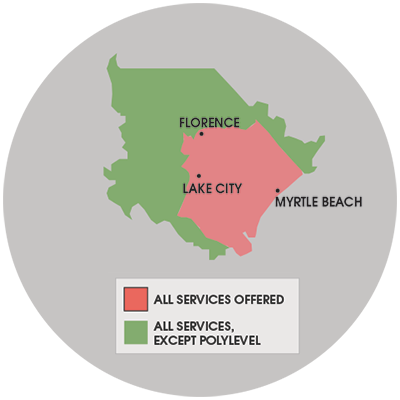 Best Home & Property Services services North Carolina & South Carolina including Camden, Florence, Gaddysville, Loris, Marion, Myrtle Beach, Rembert, St. Matthews, Sumter, Tradesville, Trio and surrounding areas. Call or contact us online today to get started!